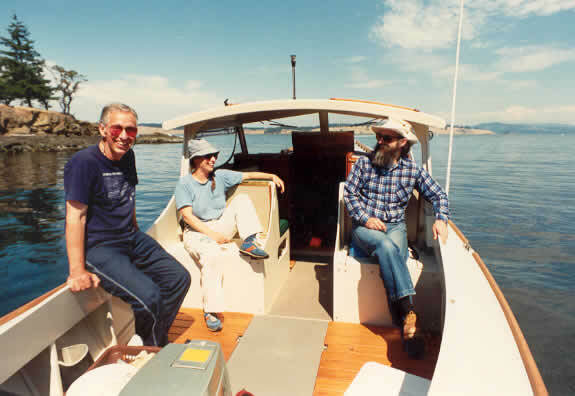 One of the most seaworthy wood boats ever designed. Load Waterline . . . . . . . . . .
Displacement . . . . . . . . . . . .
Freeboard forward. . . . . . . .
Freeboard aft . . . . . . . . . . . .
Fuel use @ 6 kts. . . . . . . . . .
Dories are wonderful for poking into coves, looking at the scenery, fishing, enjoying time with friends, crabbing, and similar civilized pursuits. 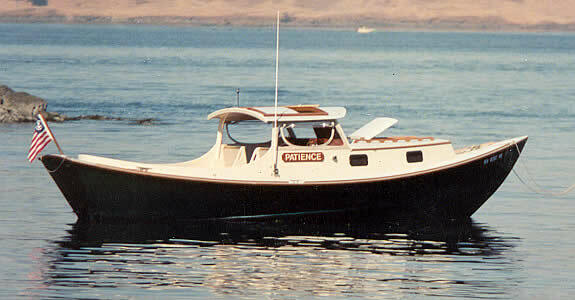 This St. Pierre dory is unusual as it is designed to travel at both displacement and semi-displacement speeds. 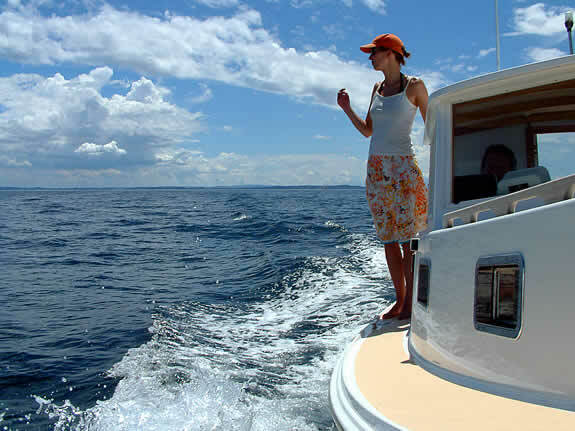 The efficient hull needs only a 20-50 HP outboard to cruise at 6-14 knots. The motor is mounted in a traditional dory well where it is easy to maintain and tilts up for beaching. The steering station is sheltered under a hardtop, with canvas that can be rolled down in inclement weather. The cockpit seats have built-in lockers and table tops so you can have your galley outside in fine weather. 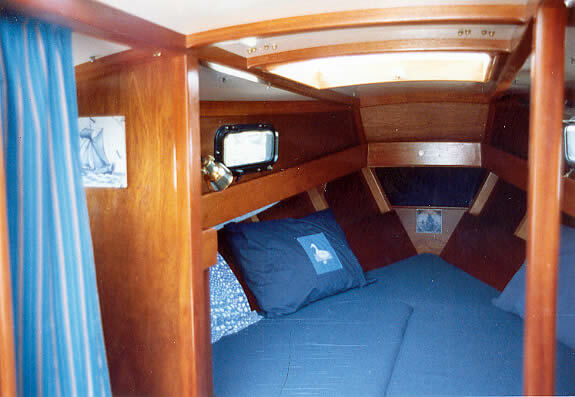 Down below there is a double berth, a separate, partially enclosed head, and a galley counter/cabinet. Beauty, economy, and comfort make this an exceptional boat for inter-island travel or cruising inland waters anywhere in the world. 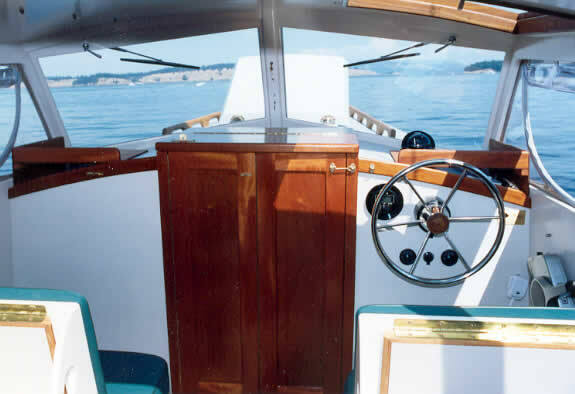 If you've ever had the desire to do a little wooden boat building, you couldn't pick a better project than this little powerboat from Nexus Marine Corporation. This St. Pierre Dory is perfect for anyone who wants a truly beautiful outboard powered craft with modern construction and the traditional appearance of a fine wooden boat. Or let us build it for you. The designer intends that this dory be built using WEST SYSTEM® or similar marine epoxy glue, so that it will not dry out or leak if left out of the water for prolonged periods. With its 8'9" standard beam, it is a little wider than the 8'6" trailering standard, but it can be easily made narrower if that is an issue. This could be a wooden boat you've built! The St. Pierre Dory lying at anchor in a cove. You might get hassled a bit by people who will come all the way across the bay or channel to tell you what a beautiful boat you have. There are worse things. Launch day for a St. Pierre Dory. Note the tilted motor in its well: all fumes and wash exit through the transom. The cover over the aft half of the well has been temporarily removed in this photo. The companionway doors and helm station. 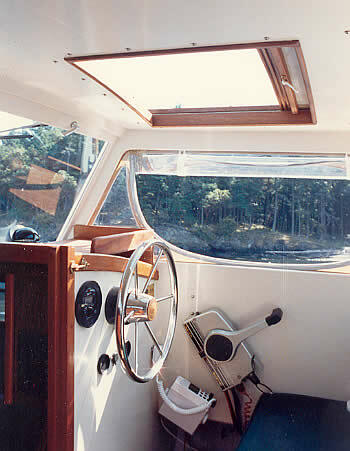 If built as designed, the self-bailing cockpit extends all the way to the cabin bulkhead. There is sitting headroom under the hardtop. When standing, the pilot has a great view with his or her head out the sunroof hatch. The wood gadgets on the cabin top are removable "tray tables" for drinks, sandwiches, and the like. Another view of the helm station. Note the tricksy anti-drip grooves in the forward end of the sunroof hatch. They work. Lounging in the cockpit. The seats on which the builders are sitting have storage under. One or both could be insulated for an icebox. 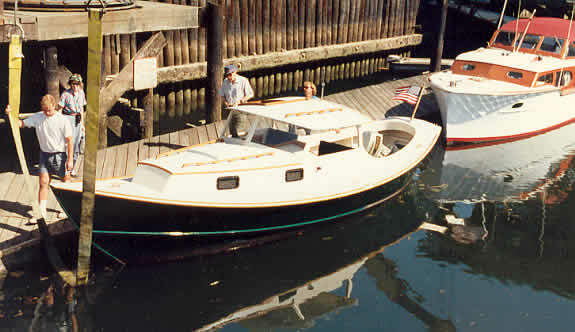 The nonskid centerline hatches give access to a rather large, dry bilge. VG fir floorboards look good and are a no-maintenance item. The cabin interior, showing the 6'8" double V-berth. The curtained alcove to port is the head compartment. The Delft tiles are a nice touch. Interior trim is Honduras mahogany. Here's Beatrice (Link) in New Zealand. I said once, in a St. Pierre forum, that going forward along the side deck is without drama. Maybe I should have said, "without trauma."